River Stories and Sense of Place: Leaf Watching. Young leaves along the river trail glow in the aftermath of rain. Crimson. Bronze. Copper. 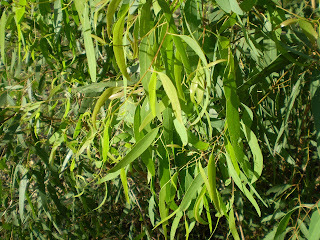 As the new leaves grow they change colour due to the green pigment that is Cholorphyll. Cholorphyll is a natural molecule engaged in an intimate tango with the sun and the wider ecosystem. It is also a very clever molecule. Its role is to capture the sun's energy so that it can be harvested for use in leaf and plant growth. By absorbing the sun's energy, Chlorophyll is able to synthesise carbohydrates from carbon dioxide and water and produce sugars in the form of glucose. This whole process from energy absorption to flourishing plant life is known as photosynthesis, literally meaning 'putting together with light'. Photosynthesis is the basis for sustaining the life of all plants and, as humans and animals alike consume plants of all varieties, and as humans breathe the oxygen from trees, this wondrous eco-cycle is the basis for sustaining the life of the whole planet. The young new growth along the river trail, the scarlet of the Callistemons, the coppery leaves of some Eucalypts and the crimsons of other gum species, have not yet been awoken to Cholorophyll's green energy. In contrast, the colour fiesta of deciduous leaves in Autumn has lost its Chlorophyll greenness and as the green fades, bountiful yellows, oranges, browns, reds and purples are revealed. As the weather cools, the energy exchange between plant and sun begins to grow sluggish. The colour green from Chlorophyll is slowly sucked from the leaves allowing the beauty of the changing seasons to explode into multiple hues. The reds and yellows are present in the leaves all the time but are not visible until Autumn when the green from Chlorophyll slowly vanishes. When the sun's energy withdraws and the days grow colder, the glucose stored in the leaves is transformed into myriad luscious shades of yellows (known as 'carotenoids') and reds (known as 'anthocyanins'). The brightness and intensity of the Autumn colour fiesta is based on the kinds of weather patterns experienced both before and during the withering away of the Chlorophyll molecules. Cold nights, clear sunny days and adequate soil moisture are the most favourable conditions for the most spectacular display of colour. 'New awe and appreciation' can perhaps be interpreted as a new spiritual movement of leaf watching in Autumn. While photosynthesis is the holy ritual of this new spirituality.